I spend more than 10 hours a day working on my laptop. That is a really long time. While we all enjoy increasingly faster and lighter upgrades to our laptops these days, one human problem remains constant: we neglect the fact that we are spending more and more time hunched over our tiny screens, straining our eyes, killing our necks, and basically screwing up our overall posture. 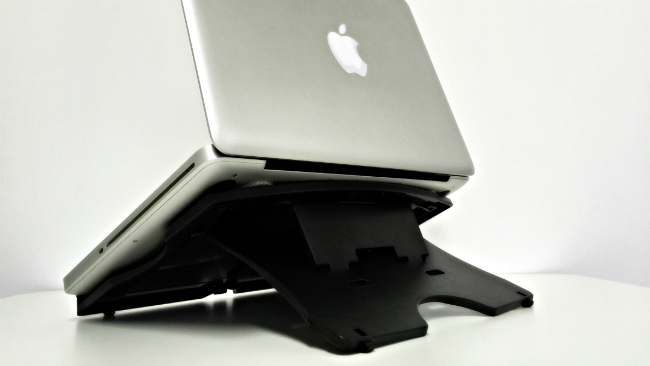 Laptops by default have poor viewing angles, and a quick fix would be to adjust them with a simple laptop stand. But whether you plan to improvise/build one on your own for cheap, or buy an expensive one with fancy designs and over the top features, it’s probably a good idea to to make sure it’s a solid one. Existing options in the market were either too expensive, not portable, or just didn’t seem worth it — even with the prospect of screwed-up eyesight and posture at stake. I thought all was lost, until one fine day, I chanced upon a small package sitting innocuously in the bottom corner of a local Popular book store (admittedly not one of your usual places to be shopping for tech). I found the Aidata EZ Laptop Riser (S$12.9o) — probably the cheapest, most value-for-money portable laptop stand you can buy in Singapore that really works as advertised. After a quick conversation with the staff, I realised that it was a rare find (it was the last batch before they discontinued stocks). Packaging quality is negligent, but at this price point you really can’t expect much. Think of it as uncovering a diamond in the rough. When you actually get your hands on the product, it immediately shouts normalcy. 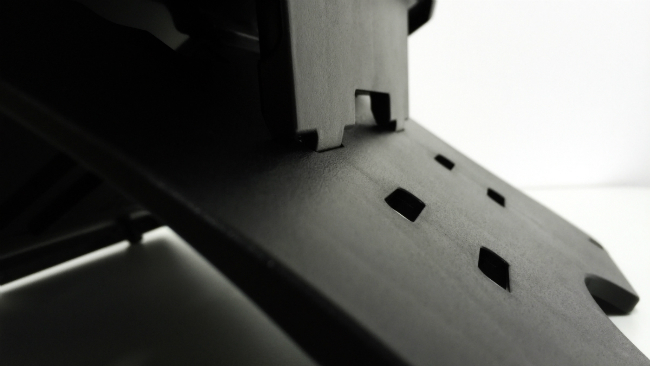 Build quality is nothing to shout about, but the plastic does feel tough and durable. The “you can throw it around the room and it will still work” kind. 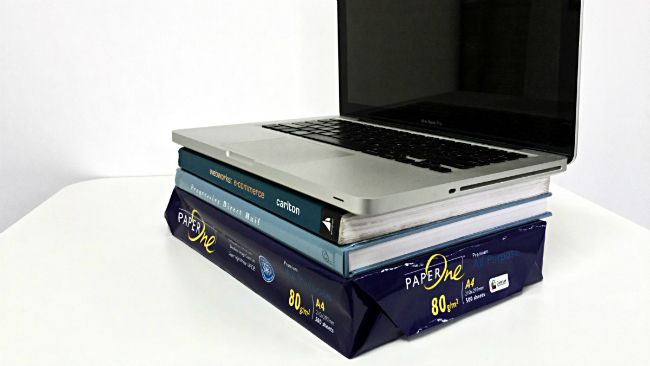 Handling wise its lightweight, portable and folds down nicely into a compact sheet that is flush with laptops. See how it fits into my work bag. 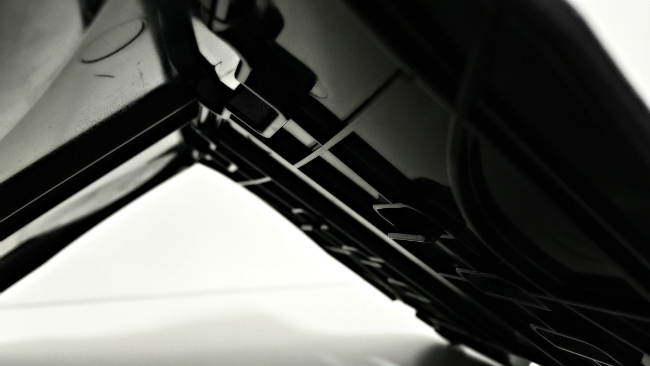 The chassis is minimally designed, yet has all the necessary functions you’d expect in a respectable laptop stand. 3 different viewing angles at 15/25/35º offers computing comfort and the flexibility to suit most casual users. I find that the stand works best for me at 25º. Rubber grips on the top surface help prevent sliding, and it fits any laptop roughly in that size range (I personally use a 13-inch MacBook Pro, but it would probably work for a 15-inch one too). 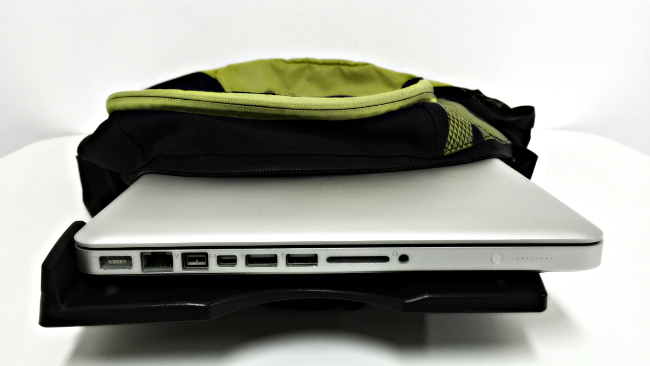 Here’s my one and only problem: sometimes, the bottom barrier that is designed to prevent your laptop from sliding off sticks out a bit too much for modern slim laptops. To sum it up: if you’ve been in the market for a laptop stand and can’t afford expensive options, it’d simply be a crime to ignore this. The stand is crazy affordable, and it does what it sets out to do without ever getting in your way. 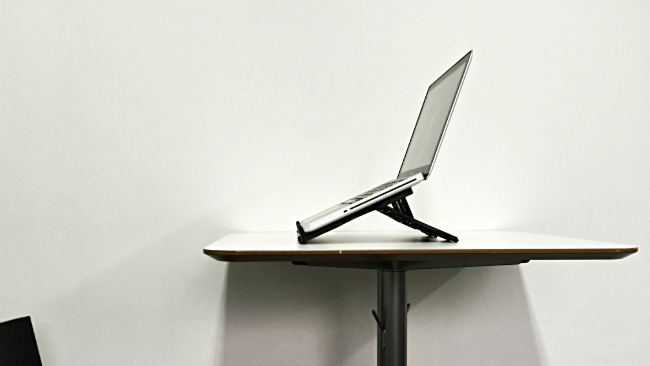 DEAL: In case you’d hate being caught in a Popular book store shopping for tech, I’m running a group order using GroupHunt — 33% off for this laptop stand (that’s S$8.60, if we get more than 20 orders). Disclosure: I’m on the GroupHunt Team. 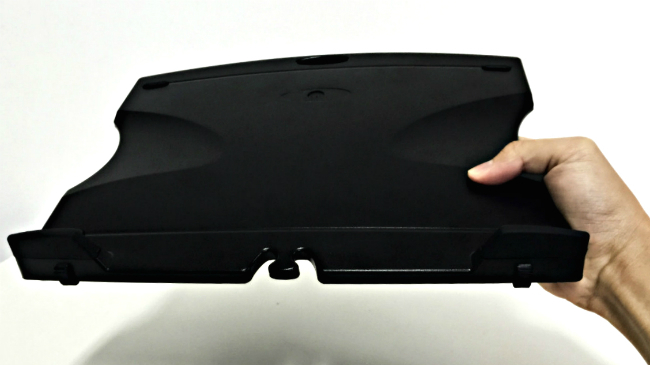 Order the Aidata EZ Laptop Riser here!